"I've Got a Funny Story"
Author and humorist John Heldon writes for his generation of baby boomers.His blog is a fountain for uplifting, useful, and humorous stories sure to inspire. On the other hand, his novels blend spirituality and the paranormal to produce smiles and moments of peace. 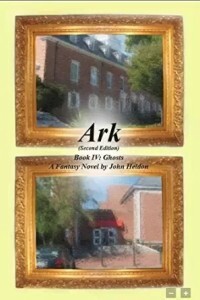 His novel, "Ark Book IV: Ghosts", is such a story about second chances and redemption. "Ark Book V: Beneath" and "Ark Book VI: Above" will soon complete the middle trilogy of the nine book Ark Saga.The first trilogy will be next. I haven't been to a baseball game since I took my younger cousin to one when he was 7 or 8. The game is just too slow for the world I live in now. Forty years ago, the world seemed simpler and slower to me, and it was relaxing to sit there (I think it was a doubleheader that day) and show my younger cousin a good time; payback for some of the kindnesses his mother gave me growing up. However, yesterday, after one inning, I was ready to hurt someone. I began thinking of ways to speed up the action. At my age (got my new Medicare card) I look forward to boosts of adrenaline. Maybe change the rules to give a batter THREE balls and TWO strikes. Give the pitcher 20 seconds to throw the ball again, or the hitter gets a "ball" added to the count. Also, since we're changing the rules, no more spitting or scratching crotches. The reason I was at the game was the team was having a "Rutgers Night", and my beloved Court Club had a table in the food court trying to sell a few memberships, tee shirts, and yes, a few of my books. After most of the schmoozing was done before game time, a few of us (each no great fan of the game) decided to give it another try. As I said, I started squirming in my seat after the first inning, and the home team losing already didn't help. What every young and old kid hopes happens to them at the ballpark. A high pop foul behind me, careening off the upper deck facade, one high bounce ten rows behind me, then a smaller one two rows away, right into my bare hand. Everyone clapped me 10 seconds of fame, while the game played on. This treat got me through the second inning, but not the third. It was time to go. Besides, how much better was the game going to get for me? Actually, almost a lot. While walking to the parking lot, another foul ball bounced on the street a half a block in front of me. I started to run. "I can't believe it!" I thought to myself, how many fans have retrieved TWO ball from one game? I think not many, if any, but I wasn't going to be one of them. I watched a younger pair of legs get to the ball before me. Then again, I did get the adrenaline rush I look for at a sporting event. I'm assuming just about everyone has heard the adage, "the only thing you should stick inside your ear was your elbow." If that adage was widely adhered to, I'm not sure the Q Tip wouldn't have gone the way of the Dodo. Still, my wife, Genna, has been on my case about my use of QTips. "You're going to puncture your eardrum!" was her constant refrain. One day after coming out of the shower, I walked into the bedroom with just the other cotton tip sticking out of my ear. "Gen, I think I punctured my eardrum." "You see, you idiot, what have I been telling you all along?" I broke into a smile, because I had just broken the end of the QTip, it was just resting outside my ear, then I showed it to her. She has a way of punching my shoulder when I goof on her like this (which is quite often) with one sharp knuckle which always seems to hit a nerve. It remained sore for a few days, but it was worth it! New York City is many things. Whatever you're looking for, it's all there. Sadly, one of those things is a restaurant graveyard. Some establishments remain open a few months, or years; that's all for most. To stay in business (any business, actually) for around 80 years in NYC is a neat trick. What started out as a very good deal grew and grew and grew, which was a good, and a bad thing. Good for prosperity, bad for food service and quality. Some of my earliest memories in the 50's were standing in line outside, as if waiting for a blockbuster movie. Once in, I remember going from room to room to room until we reached our table, and never seeing that much food in my young life! By the late 50's, we stopped going. It had become a tourist trap, and there were plenty of good restaurants in New Jersey, where we lived. After I began courting my wife, I reminisced with my father in law to be, George. "We never waited on line at Leone's," he recalled. "The FIRST time I pulled up to the front door to let the family get in line in my brand new Olds '98, I saw this parking attendant motion to me to drive into the lot a few doors away. I told everyone to stay in the car, and took him up on his offer. When I pulled into the lot, the man noticed I was not who he was expecting." "I thought you were Gene Leone (Mama's son)," he said, " You have the exact same car and color. Now that your here, and if you don't mind walking through the kitchen, go ask for Gene, and tell him what happened." So they all trudged through the kitchen, and met Gene Leone inside the front door greeting the line as it came in. George and Gene became fast friends, and George and family continued to come through the kitchen until 1959 when Gene sold the business. After that, it wasn't worth going anymore, anyway. "Oh, Winston," she replied, "You've been tippling again; you're quite drunk." "Indeed, I am, Madam. However, tomorrow, I will be SOBER!" Churchill attended a reception and sat next to a stiff necked bishop. "Young lady, I would rather commit adultery than take an intoxicating beverage." Then Churchill called the girl, "Come back, lassie, I didn't know we had a choice." "An appeaser is one who feeds the crocodile hoping it will eat him last." "Eating my words has never given me indigestion." "Some men change their party for the sake of their principles; others change their principles for the sake of their party." "It would be a great reform in politics if wisdom could be made to spread as easily as folly." The last couple are probably more serious than funny, sadly. I just read an article about a very environmentally sensitive area at the Jersey shore which was having an infestation of poison ivy. Herbicides and chemical treatments could not be applied due to the water table and very sensitive ecosystem. What to do? Bring on the goats! It turns out most other mammals besides humans are immune to the effects of poison ivy. Rabbits, goats, deer,among others regard the ivy as a treat. So the proposed solution is to bring about 30 goats to the infested area, and let them chow down to their heart's content, until the ivy is gone. The next thought I had upon reading about the goats was how I had to slave away at our shore house on Barnegat Bay during the 50's and 60's when each year the weeds would take over the property. My father was opposed to herbicides ( and gasoline which one neighbor was in favor of); instead each season we ordered about 20 cubic yards of sand to spread over the property and cover the weeds. This was done mostly by me, with a shovel, rake, and wheel barrel. WE COULD HAVE RENTED A FEW GOATS! My mother should have had this idea because growing up she had a couple of goats in her barnyard zoo. Then again, I would have had a choice to make: shoveling sand, or picking up goat poop. I was in pretty good shape back then... sand was good. I may be a little late to the party (but then again, I don't drink THAT much), but this is the name of the best Bloody Mary mix I've ever found. Why do I think the best? Because you don't have to add a thing to it, except vodka. I have to give you some history. I used to make a mean mixer myself. I was the toast of the tailgate. Here it is (or was): V-8 juice, a few globs of fresh horseradish, more than a few chokes on the pepper mill, several wrist shakes on the Tabasco bottle, a palm full of celery salt, ice, and vodka, measured by me judging by how stiff the crowd was, and how loose they needed to be. This concoction was the "control" formula for Bloody Marys at our events. In reality, it was designed to please Genna, my wife, but I guess everyone else agreed with her. Then, to make a long story short, Genna had a health crisis which changed her body chemistry, including her taste buds. Suddenly the old mixture didn't do it for her. I kept trying different variations, and each one just got me that classic wrinkled nose rejection of hers. We'd given up Bloody Marys for some time, until we were in Florida last month at our favorite place, Caffe Luna Rosa in Delray Beach. Bingo! That mixture did the trick, for both of us. John, the manager, was kind enough to tell me Zing Zang was the mix. Praise the Lord, I thought, I'm back in the Bloody Mary business, but the story then got a little tricky. We got home from Florida, and I could find Zing Zang anywhere; not even Wegman's had it. "Gen, were down to our last eleven bottles, I better order another case, lol!" That's how good it is. For the past couple of years at this time, we visit our dear friends at the place they rent, located at the corner of the Atlantic Ocean and the north end of Island Beach State Park at the Jersey Shore. Winnie and Tom's funny bones are in sync with ours, and when ever we get together, its a laugh a minute, from subject to subject. We're grateful for this, because they belong to a club which no parent should: those who have lost a child. I always feel my wacky behavior is put to best use when their sides ache from my antics. At my best, I can be a supplement for high blood pressure and stress reduction. We arrived at the rented condo mid afternoon last Wednesday, without any commotion like occurred before our arrival last year. At that time, a woman had gone onto to the dunes to change out of her wet suit, without seeing (or caring that) Tom was on the overlooking balcony. "Could you tell if she dyed her hair?" I asked. Laughter from Tom and Winnie, dagger eyes from Genna, my wife. This year the only thing to discuss when we arrived was what we were going to start drinking. After an hour or so, we put together an order for pickup at Berkeley Restaurant and Fish Market in South Seaside Park, NJ. Great place, the seafood is fresher than I was to most of my old girlfriends, and Nick put together our order of 2 lb. lobsters, scallops, steamer clams, corn, potato salad, and cole slaw. I almost suffered a minor injury trying to sample the size of one of the steamer clams. I didn't see the blue claw crab in the box to guard the clams, and he took a swipe at me. Tom and I returned to the condo with our cooked feast, and for the next three hours ate, drank, and laughed into a stupor. Actually, just Genna ate for the next three hours, while the other three of us drank and laughed. She had collected everyone else's tiny lobster legs, and tediously drew out all the meat, oblivious to the time versus reward aspect of her effort. The heavy salt air helped us decide to retire early, which caused me to get up earlier, and see the sunrise from the balcony. After the rest of the troop became functional, we headed to a buffet breakfast a few blocks away, then packed the car, and headed for home. Showing Winnie and Tom a good time was one thought I had. The other was, I could get used to this, I really miss the ocean. Click the image to preview my book on Amazon.com. "I know what a lessor Sorkin is...and I want to be one."